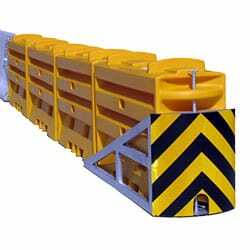 For the safety of workers and motorists, we offer Sentry Longitudinal Energy Dissipater (SLED) impact attenuators to shield the end of concrete or steel structures on the road, cushioning the structure and absorbing the shock of impact in the event of a car crash. We offer both TL-2 and TL-3 SLED models. To learn more about SLED impact attenuators or to get a free quote, please contact us. FHWA accepted for shielding the blunt end of concrete, steel, and water-filled barriers. Crash cushion can be installed quickly and easily. TL-2 and TL-3 models available.